Like I said at the outset, conflicts within a band can take a variety of different forms, and there definitely isn’t a cure-all. I’ve shared a bunch of tips with you in hopes that it will give you some ideas on how to handle different situations, but it’s important to tailor your approach to the specific individual and circumstances you’re dealing with. I believe developing a long-term vision for the band is absolutely essential to its success, and unless you and your companions are willing to look at the next five, 10, or even 15 years and determine what your goals are, making your dream a reality is going to be an uphill battle. When it comes right down to it, there are really only a few ways you can deal with conflict. Let’s take a look at each. Some say if you ignore something for long enough, it will go away. This usually isn’t the case. 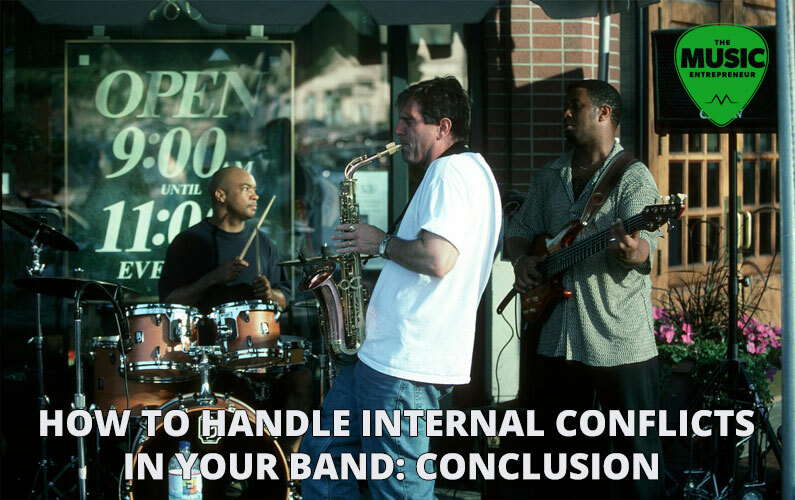 Even if everything appears fine on the outside, your band members are probably stewing on the inside. Doing nothing is an option, but in most cases not the best one. It’s unlikely, but you might be dealing with a time-sensitive issue that could be better dealt with in the future. For example, one of your band members may be having some time related issues now, but once they’ve streamlined their life a little better, they’ll be better able to focus on the band. If you have an important show or a recording sessions coming up, you might choose to deal with it later. But like I said earlier, problems tend not to go away on their own, and putting it off for too long is just irresponsible. You can charge headlong into the issue to try to sort it out. It’s still best to exercise grace and sensitivity to the situation, but confrontation is often a necessity. It isn’t always the best option, but it usually is. It’s better to get things out into the open early than to have things blow up in your face at a critical moment in your career. You don’t have to agree on absolutely everything, especially if it doesn’t affect the outcome of the music you make, the image you portray, or the message you’re putting out into the world. You might think you need five rehearsals before the show. Another band member may only need two. If two is enough, and they’re performing up to snuff, there’s no point in pushing the issue. You can always spend more time in personal practice if you need to brush up on your material. In instances where decisions have to be made, but you haven’t reached consensus as a group, you may consider coming to some kind of compromise. This isn’t the ideal situation. The dangers of design by committee are well-documented. But if it means the difference between maintaining peace in your band and stirring up issues unnecessarily, compromise might be a better option. Just beware of compromising on every issue. This is unlikely to turn out well. If you can, designate a leader in the band. This may not work in every instance, but it often is a better idea to defer to a balanced (i.e. not arrogant or prideful) leader than it is to take sides on issues. If you have an even number of members in your band, division (i.e. two-member splits on the issue) can be a real pain. Also seek out mentorship or counseling if need be. The pain of losing members can be far-reaching, and replacing parts of your band could have a huge impact on your sound, either for the better or for the worse.